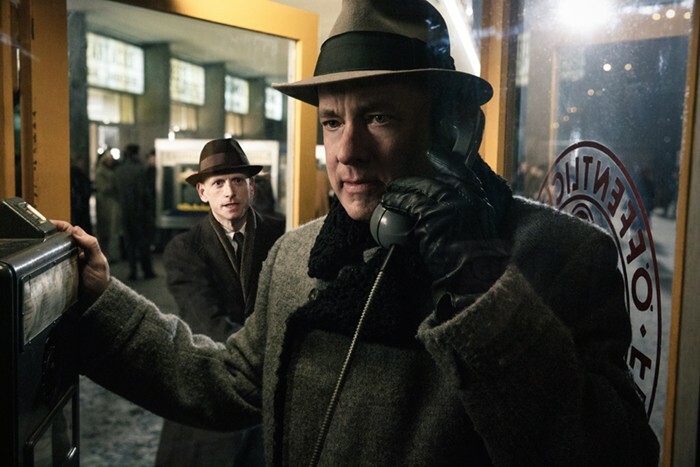 How Tom Hanks won the Cold War, in Bridge of Spies. Sure, its Spielberg, but this one is surprisingly easy to watch. Tom Hanks stars in Bridge of Spies. Directed by Steven Spielberg. With Tom Hanks and Mark Rylance. Now playing. Bridge of Spies finds filmmaker Steven Spielberg, three years after Lincoln, resuming his ongoing tribute to America’s Greatest Generation, guardians of the post-World War II world and creators of the prosperity in which he grew up — an era he never tires of chronicling. It takes the form of a Cold War historical spy drama, circa 1960, involving US intelligence, the Soviet Union, a lone Soviet spy arrested in New York, an American spy-plane pilot shot down and captured by the Russians, the divided city of Berlin, and a Manhattan lawyer played by Spielberg’s prime example of wholesome Yankee integrity, Tom Hanks. On the face of it, then, a can of USDA-inspected creamed corn dumped into a bowl of borscht. But it turns out to be surprisingly easy to watch. Insurance lawyer James Donovan (Hanks) is called upon, in one of those of those plot mechanisms we’re not supposed to even notice — the screenplay is by the Coen Brothers, Joel and Ethan, with script doctor Matt Charman — to defend recent immigrant Rudolf Abel (English actor Mark Rylance), a mousy fine arts painter who has been caught slipping top-secret info to the Russians. Abel is a spy no one takes very seriously except as potential trade bait, but his demeanor is one of complete unflappability. Rylance’s performance turns this potentially loathsome traitor into the movie’s second-most appealing character. Simultaneously with Abel’s arrest, a secret U-2 spy plane piloted by Francis Gary Powers (Austin Stowell) is shot down over Sverdlosk while snooping from 70,000 feet. The Pentagon wants Powers back before he can spill what he knows, and the Russians want Abel for the same reason. So the affable Donovan — who happens to have participated in the Nuremburg war crimes trials — gets sent to Berlin just as the infamous Berlin Wall is being built, to engineer a swap. Thus the entire US-Russian cat-and-mouse espionage game gets loaded on Hanks’ All-American shoulders. Game over, checkmate, we win, the Vopos and Stasi might as well tear down the wall and start filling out West German entry papers. The story’s flavor is in how it happens. Hanks’ Donovan has the weary, sagging presence of an old warrior plunked down in a brave new world, and yet in his back-and-forth with sardonic CIA handlers and devious Eastern Bloc officials, amid the cold hostility of life on the other side, his courtroom skills serve him well. He’s faced tougher negotiators. It occurs to us that Donovan enjoys taking on Iron Curtain adversaries in order to satisfy his own sense of fair play, especially when a wild card gets shuffled into the deck — an innocent American student (Will Rogers) picked up by the Stasi on trumped-up charges. Bridge of Spies’ most flavorful moments hark back to the Fifties spyboilers young Spielberg must have watched on TV — eerie, tchotchke-filled office encounters with a wily KGB apparatchik named Schischkin (Mikhail Gorevoy), or with Vogel, an East German security chief annoyed with his Russian handlers (Sebastian Koch); or a tense confrontation with an NYPD cop infuriated at Donovan for defending the lousy commie rat Abel. Spielberg and the Coens obviously look back at the red scares and school-kid “duck-and-cover” drills with something like affectionate disapproval, the idea being that nuclear saber-rattling was a nuisance that could be neutralized. After being gilded by S’berg’s beloved Norman Rockwell-style visuals and a Thomas Newman music score, the Cold War looks not only winnable but cozy. All it takes is a little GI know-how by Spielberg and Hanks to sort it all out. Before we know it, we’ve accepted the Spielberg version of history. If only foreign relations today were this easy.